Looking for a dynamic, fun and safe way for kids to chase each other around and shoot at one another? Try using Nerf Blasters. Any area with a good balance of open space and cover can be a candidate, ranging from “informal shootouts” in offices and basements to well-organized outdoor battles with high-powered modified blasters. For larger wars with more participants, bigger venues like gymnasiums, public parks, forests, ravines, and schools make good playing areas. Because they’re so safe, Nerf wars can include participants and battlefields otherwise unsuitable for things like airsoft or Paintball. 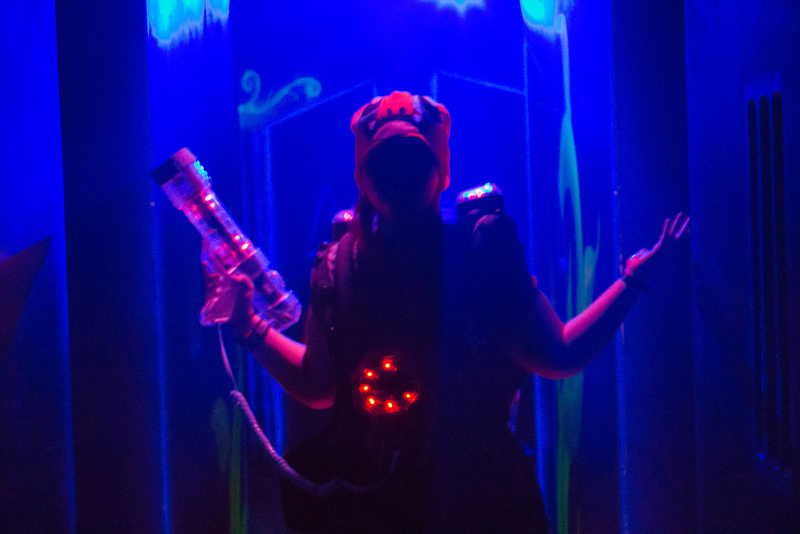 Laser Tag works very hard simulate an actual nighttime battlefield. You use hand-held infrared-emitting targeting devices to try to hit targets worn on your teams’ opponents. Because everything is transmitted using light, getting hit is 100% harmless – even if it is disappointing to get tagged out. If you play it on a professional playing field, you’ll have the opportunity to experience futuristic lighting as well as make use of a variety of barriers and levels. The best players will use team strategy. If you haven’t given the game a try, you definitely should! With some string and some balloons, you can create a new tagged variant that can be a lot of fun in a larger group. Get started by inflating a number of balloons and then tying a string around the ankle of each team member. Everyone will be tying a string to their ankle with two teams of red and blue players. You can create a variant where players use two balloons if the game ends too quickly. The goal is to have a team that will eliminate the other players by popping all of their balloons. Work together as a team to isolate other players or work individually to eliminate other players from the game. Once your balloon is popped, you must sit out on the sidelines. Sticks deal is best played with two teams of five players each, and the goal is to lay a rope in the center of the play area so that each team has their own zone. Build six circles with jump ropes on either side of the line with three circles on each side. Each side will have four popsicle sticks inside every circle. The end goal is to retrieve all of the sticks from the other team and return them to your side for collection. If a player is tagged on the side of the enemy team, they must go to the end of the enemy team’s play area and be tagged back into the game again. Players inside the sticks circles that have not been tagged are safe until they leave the circle. The team that is able to collect the most amount of sticks in their circles at the end of 10 minutes will be the winner. 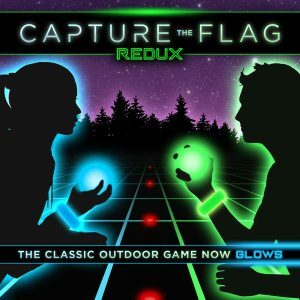 Capture The Flag REDUX is a fantastic glow in the dark variant of capture the flag that includes glow in the dark orbs (used as flags), glow in the dark flag markers, and glow in the dark armbands for every player. 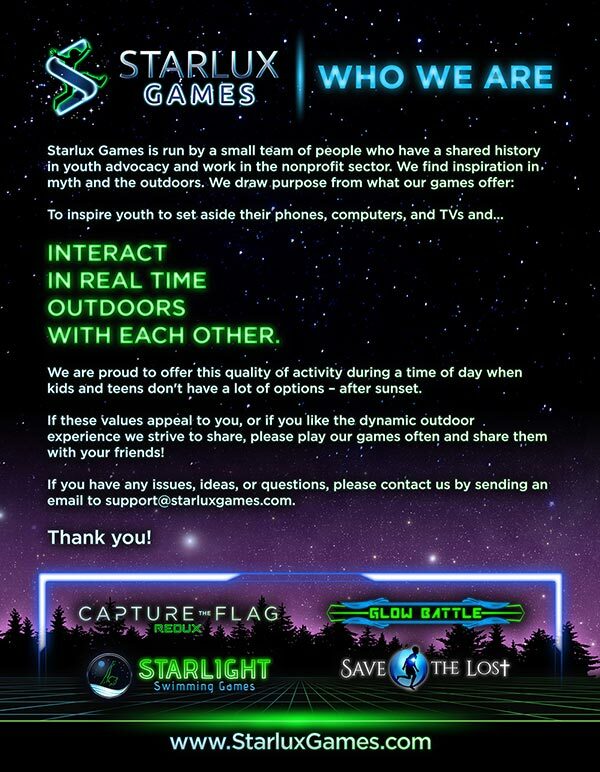 By turning out the lights or waiting for night, you can play traditional capture the flag with a modern twist. Using all your senses, guarding your flag as well as tagging other players to capture them in your zone can all be part of the fun. It’s an incredibly fun and active game and playing with the lights off can be an exciting change for almost any type of youth program activity.